Paper on observation of Higgs boson decay to bottom quarks submitted! A precise measurement of the rate of the H→ bb process directly tests the Yukawa coupling of the Higgs boson to a down-type quark, and is necessary to solidify the Higgs boson as the possible sole source of mass generation in the fermion sector of the Standard Model (SM). While the decay of the Higgs boson to bottom quarks is the most frequent of all Higgs boson decays, it has been a real experimental challenge to observe it. This is on account of the overwhelmingly large background contribution from a number of other SM processes that can mimic its experimental signature characterized by the appearance of a bottom quark and anti-quark. The CMS Collaboration overcame this challenge by deploying modern sophisticated analysis tools and by focusing on particular signatures where a Higgs boson is produced in association with a vector boson V (a W or Z particle), a weak interaction process known as VH(bb), shown in the figure below, leading to a significant reduction in the background. 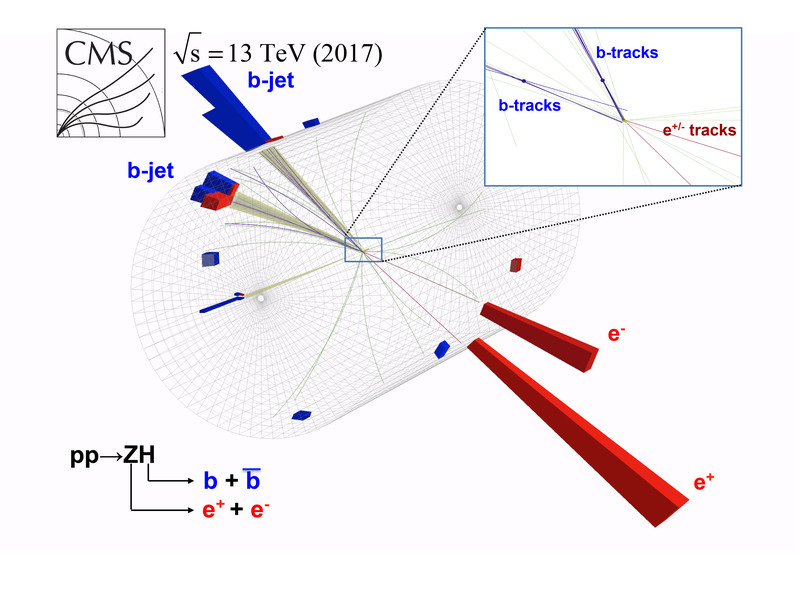 Data collected during the 2016 and 2017 runs at 13 TeV center-of-mass energy, as well as earlier data taken at 7 and 8 TeV, have been used by the CMS Collaboration to maximize the sensitivity of this measurement. An excess of events is observed with a significance of 4.8 standard deviations, over the expectation from the background-only hypothesis. The corresponding expected significance for the SM Higgs boson with a mass of 125.09 GeV is 4.9 standard deviations. A combination of all CMS search results for the H→ bb decay is performed, including all four primary production processes at the LHC: VH (reported above), gluon fusion, vector boson fusion, and associated production with top quarks. The observed (expected) signal significance is 5.6 (5.5) standard deviations and the measured production rate is compatible with the expected rate for the SM Higgs boson. This result, just submitted to the journal Physical Review Letters, represents the observation of the H→ bb decay by the CMS experiment. This current measurement is consistent with the SM expectation, however, its precision still leaves room for contributions from new physics. In the coming years, much more data will be collected and the precision will be improved in our quest to see if the Higgs boson reveals the presence of physics beyond the Standard Model. Observation of Higgs boson decay to bottom quarks, Submitted to Phys. Rev. Lett.